If you're looking for mens polos with online logo services, you've come to the right place. Our logo polos are well-made and stylish, with a relaxed fit and a button collar that ensures everyone will find them comfortable. Our high quality fabrics also resist shrinking, pilling and losing their shape, so that you can be sure our shirts will fit for a long time to come. If you're not sure which of our cotton polo shirts with logos will work best for you, consider options such as our pique polo shirt with embroidery or our tournament polo, both well-cut options that come in a variety of colors and styles. The Greg Norman Play Dry Heather Polo is an elegant way to draw attention to your company. This Polos are perfect for office wear or any outdoor sports event. Features Hemmed cuffs and an even-hemmed bottom with tailored side vents create a neat and clean appearance. 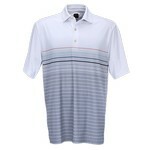 The promotional Greg Norman Play Dry Horizontal Stripe Polo is comfortable and helps to keep you dry. Features even-hem bottom with tailored side vents and attractive self-goods collar. Shark logo embroidered bottom left hem. This Greg Norman Play Dry ML75 Micro Lux Solid Polo is tightly knit microfiber polyester material and lightweight. The Play Dry moisture management feature ensures that you stay dry and feel fresh all the time. Shark logo embroidered on back. Our custom printed Greg Norman Play Dry ML75 Tonal Stripe Polo has tailored side vents and an even hem bottom. Our custom Greg Norman Play Dry Performance Striped Polo has subtle stripes and a rib knit collar. Our Harriton Men's Polytech Polo Shirt features a clean finished inside neck with self-fabric neck tape. The Men's Advantage Polo features Ribbed collar, UV protection which acts as the best promotional product for all your business events. This Polo features Rib cuffs and forward angled shoulder seaming create a clean and finished look. Comes with Side vents to keep you cool and comfortable throughout the day.